EPA's New Biofuel Regs Could Curtail Industry The EPA recently issued new regulations based on science that says biofuels may not be as good for the environment as proponents first thought. The proposed policy — based on an earlier law that says biofuels must do more good than harm — could make it tougher for the industry to grow. 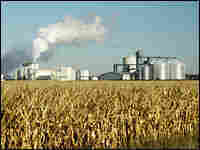 Like at this ethanol production plant in South Dakota, most biofuels in the United States come from corn. Getting fuel from green plants seems like a great idea. But scientific research over the last few years shows that biofuels aren't necessarily helpful in combating global warming. Based on this data, the EPA has drafted new, tighter regulations that could make it harder for the biofuels industry to grow. In theory, biofuels themselves don't add any extra carbon to the atmosphere. Green plants take carbon dioxide out of the air, so when you burn them, the carbon dioxide just goes back to where it came from. But an industry based on this idea turns out not to be so green. For one thing, when the ethanol industry took off in the United States, so did the price of its main raw material — corn. So farmers in places like Brazil planted corn on their pasturelands to cash in, but they still needed land to graze their animals on. "Where's Brazil going to get more pasture?" Bruce Babcock from Iowa State University asked at a House agriculture subcommittee hearing on Thursday. "Well, by converting Amazon forest and savannah. Thus the argument goes, any increase in Brazilian cropland leads to deforestation and a loss of savannah." And deforestation puts huge amounts of carbon into the atmosphere. The EPA attempted to factor global deforestation into its regulations on biofuels. The agency's analysis found that in general, deforestation driven by high corn prices actually makes biofuels look bad from the standpoint of climate change. And, the 2007 law that the new regulations are based on says biofuels must do more good than harm — both globally and domestically. But Babcock, along with the biofuels industry, is arguing that the effects of biofuels on forests around the world are being exaggerated. Proponents say the industry is actually better for the climate than the EPA analysis suggests. He acknowledges that there's been a lot of deforestation in Brazil, but disagrees with EPA findings: "There's scant evidence that increased production of crops has been the primarily culprit in the loss of Amazon forest. Certainly cattle and pasture have increased in the Amazon since 1996. But was that due to the 36 percent increase in Brazilian cropland, or the 30 percent increase in the cattle herd in Brazil?" Given that uncertainty, the biofuels industry is trying to get the EPA to back down from its conclusions about deforestation and biofuels. If the EPA sticks with its analysis, the industry fears the rules could harm it. "I think it's terribly important, this investment made in good faith not be relegated to rusting hulks of steel on the prairie," said Rep. Earl Pomeroy (D-ND). 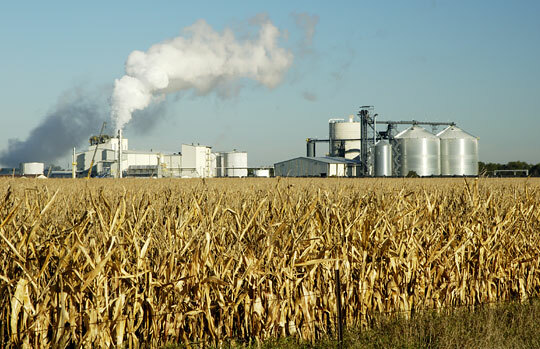 In fact, the EPA's new regulations would let existing ethanol plants keep operating, regardless of the climate impact. It's new plants that face an uncertain fate. That's partly because the biofuels industry economics have turned sour. But it's also because of the science that led the EPA to draft the tough rules it recently announced. "What I think this means for the industry," says Dan Kammen at the University of California Berkeley, "is you need to innovate. And there are pathways that look very much more attractive than others." Kammen says, for starters, it might make sense to rethink the best way to get energy out of green plants. A study in the latest Science magazine, for instance, suggests that liquid fuels like ethanol aren't the best way to go. Better to burn the material to make electricity. "Taking a biofuel and making electricity from it can be done relatively efficiently," Kammen notes. "And then the benefit, of course, if your car is running on electricity, you use an electric motor to drive the wheels, and that's very efficient." But of course there are practical and economic reasons we won't all be riding around in electric cars anytime soon.